As I mentioned in my recent post about Warren pears, I like pears but have a hard time getting super excited about them in their raw form. I do love one here or there, but for the most part when I have pears they end up lending their delightful presence to something larger or smaller as the case may be. So I was thinking today about what I would do if someone handed me a basket of pears and said “You have an hour. MAKE SOMETHING!” This would truly be my nightmare. I’m not that comfortable improvising and I can’t remember what goes with what. I absolutely love watching these shows because the creative genius of the contestants is so absolutely astounding to me. They seem to light up, whereas my first response to this craziness being shouted at me, would be to ask if I could have my books. The contestants never use books! How is that possible? I have this one called the Flavor Bible that is spectacular. You look up a food and it gives a huge list of other foods that go well with it. It was clearly written by and for improvisers. All I’ve ever done is drool over it, which is why the pages in the cheese section are all crinkly and stained, if you ever happen to borrow my copy. Chips: Cut pears in 1/8 inch slices, place in 200 degree oven for 6+ hours until crispy. Optional: sprinkle with cinnamon first. Dried fruit: Slice in 1/4 inch slices, place in 200 degree oven 4-6 hours until soft and pliable. 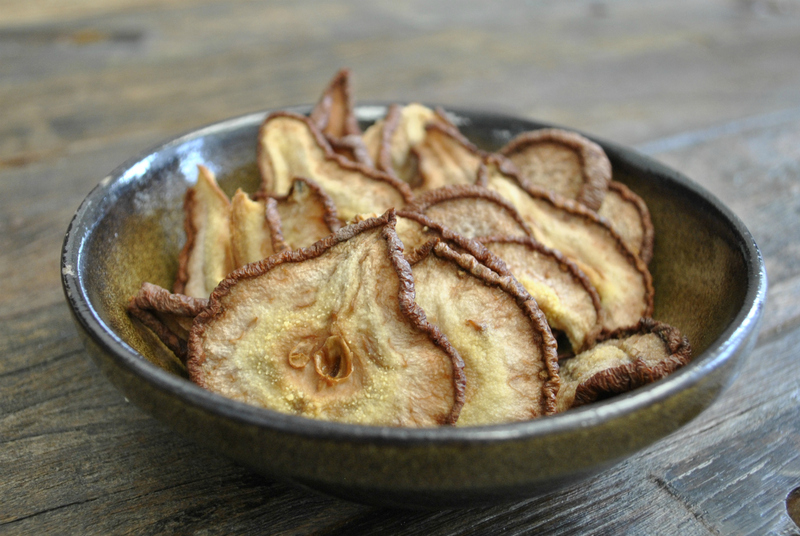 Tea: Chop up some of the dried pears or pear chips with a bit of broken cinnamon sticks. Steep in boiling water for 5 minutes. Drizzle with honey. Optional: Add brandy or rum. Quick salad: Slice pears as thin as you can, layer with equally thin slices of pecorino cheese. Drizzle with honey and plain or candied walnuts. Side dish: Chop pears and throw in a saute pan with butter and a little brown sugar. Cook until tender. Drizzle with balsamic vinegar. Ice cream topping: Chop pears and throw in a saute pan with butter and a little brown sugar. Add a bit of powdered or candied ginger and a little cinnamon. Cook until tender and pour on top of vanilla or salted caramel ice cream. Appetizer: Slice pear and place on plain cracker with a bit of gorgonzola. Sandwich: Add a few pear slices in your grilled cheese sandwich. Especially great with sharp white cheddar. Cocktail! Puree pear and strain through fine mesh strainer to get the smoothest consistency possible. Mix an ounce or so in with a glass of champagne. Showstopper: Cut pear in half and remove core. Fill with a little goat cheese. Sprinkle with thyme and bacon bits. Drizzle with olive oil, salt and pepper. Roast at 350 for 25 minutes. Drizzle with honey and place on bed of arugula or other spicy green. what an awesome list! I agree with you about pears being good but difficult to get into in their raw form. Thanks for the ideas. Thanks Janice! Let me know if you try any of them. We had # 10 for dinner with our friend Jen. It was soooooo good! Yay! I’m so glad they turned out well.